It has been about a month since the launch of our blog! It’s high time that we introduce ourselves a little bit more and get to know you all, our awesome readers. What do you do and how does that affect your pen choices? Katherine: I work at Sift Science as a Solutions Engineer and team lead. I work pretty closely with many of our customers, so I’m constantly on the phone, in and out of meetings and generally running around. As a result I tend to carry a notebook and prefer pens I can get to easily (not looooong unscrews) so I can jot down quick notes easily. My office is pretty close to paper free, so I bring my own notebooks to work (currently a Travelers Notebook and a Nanami Sevenseas Crossfield) and, of course, supply my own pens and ink. Franz: I work in a bank as a customer service manager. I am that person who goes around the office to meet a client, or assist a co-worker. And the job requires me to be able to jot down notes or sign my name multiple times in one day. Before I got into fountain pens, I used to be that guy who kept on asking, “Do you have a pen?”. Now, I have a backup pen (or two) just in case I left my main pen of the day on my desk. As for pen choices, as long as it is comfortable, the cap doesn’t take forever to unscrew, and it writes okay on cr-opy paper. I tend to choose either fine, or medium nibs on my pens as a compromise between Tomoe River paper for personal use and the copy paper used at work. P.S. Now, I am that guy who tries to spread the joys of writing with a fountain pen (Penvangelism). Pam: I am a pharmacist at a hospital. I work both in the pharmacy itself and on the patient units. At work, I have been called the “pen pusher.” I have introduced Jetstreams and Pentel Energels to my colleagues in the hospital. Sadly, our supply closet is still filled with generic, gummy, ballpoints. The only paper available is cheap copier paper. Luckily, I really enjoy EF and F nibs. They work pretty well on the cheap paper and I prefer pens that are really fast to deploy for quick notes given how healthcare can go from 0 to 60 in a couple second flat. A finer and stiff (steel) nib really helps keep my lines consistent due to my small handwriting as well. Katherine: Ha. I had a cheap, bright yellow Sheaffer as a kid. I was about 9 when my mom got it for me, complete with a bottle of Skrip blue with the old-style side pocket to make filling easier. I loved the pen, but generally made a mess. Fast forward many, many years and I rediscovered fountain pens by buying a Pilot Metropolitan off Massdrop. It’s hard to believe, but I bought my Metro and a bottle of Noodler’s HoD because it was CHEAPER than the number of gel pens I was going through. 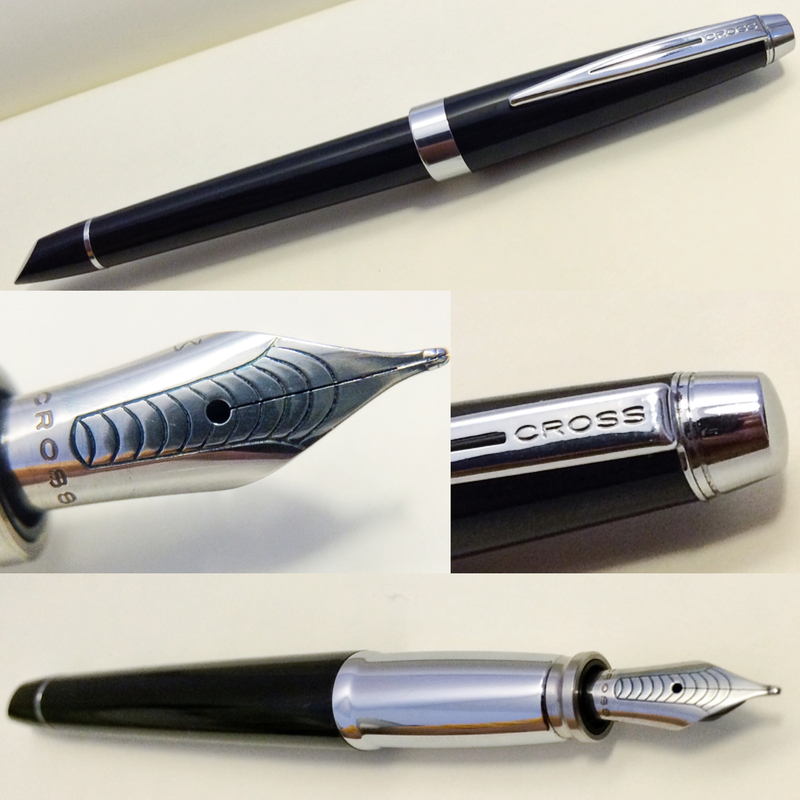 Franz: It was an onyx Cross Aventura with a medium nib and I still have it. As I wrote with it, I found that the writing was too bold and that it almost bled through the paper. I was a little bit turned off at first but I think I loved the idea of writing with a fountain pen more so I kept on it. I later found out (probably the next day) that there are different types of paper and more fountain pen friendly paper exists, I also found that writing with a fountain pen does not require bearing down on the pen with pressure like I would on ballpoints. And so the pen addiction began. Pam: A green/grey Kakuno, F nib (of course). That was soon followed by the Pilot Petit and the Metropolitan. How do you carry your fountain pens? 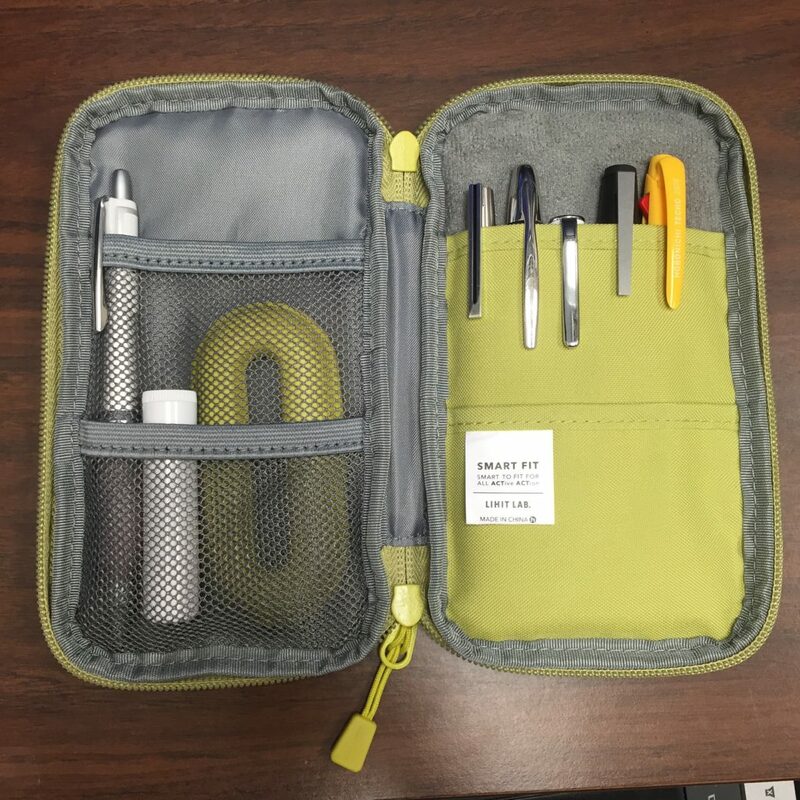 Katherine: I typically carry mine in either a zip pouch from Franklin-Christoph or a three-pen sleeve I made out of a piece of fleece. The former gives me more flexibility with pen sizes (it fits ALL of my pens). The latter gives me more protection from leaks, and if I want to bring multiple pens, stops them from rubbing together. Sometimes I’m lazy and just clip my pen to the inside of my notebook and throw it in my backpack… but I’m pretty sure this is how I end up losing a pen and try not to do it too often. 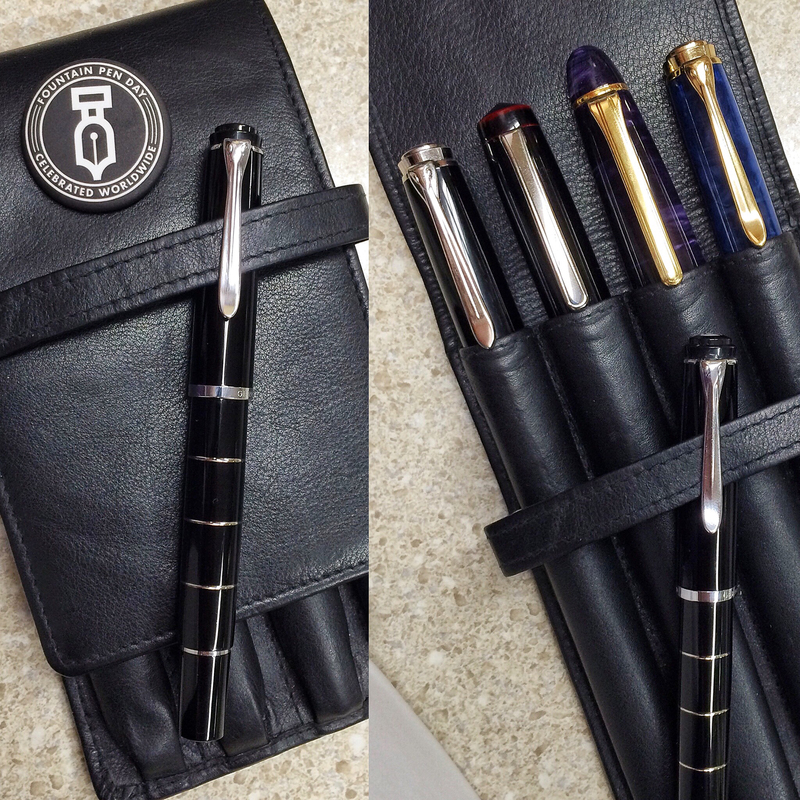 Franz: It has been a while now since I’ve been using a 4 pen leather case to carry my pens to work. I got this from the Andersons’ table at the 2014 LA pen show. This is my go to case and it’s just perfect for me. Franz’s 4 pen leather case. It can carry 5 pens as well. Dear reader, answer us this, what was your first fountain pen? March: The Six Pen Challenge! My first fountain pen was some Schneider or Stabilo I got as a kid in elementary school. Plastic fantastic but hey I would lose them once a year or so. Is that a Pelikan M215 in Franz’s case? It seems like an interesting choice, especially with the focus on hand size here. That Logo must’ve jumpstart the pen hobby for you. Do you still have it? I do indeed! That pen is still my best for unknown paper so it gets a lot of use. I also have an M205. This sounds strange but I bought it after reading several negative reviews. “Too light” and “too small” often translates to “just right” in my hands. I look forward to that review! I purchased a three pack of Pilot Varsities to try fountain pens. After that I went to a Duke Uranus Fat Boy (which I still love the design of that cheap pen). Them Varsity pens are cool. I bought a three pack in 2012 as well. I emptied out the black one, I still have the blue, and I gave my Mom the purple one. =) I haven’t used Duke pens before though. My first fountain pen was a gold filled filigree over green ebonite Eclipse lever fill. It was from a pen/pencil set I found in a box of stuff after my grandfather passed. I had it reconditioned by Fountain Pen Hospital and I still have it although, sadly, the barrel has broken at the threads. Thanks for sharing Fred! That’s an heirloom for sure. Bring it sometime at the posse/show when you can. Would like to see it! Hi, Katherine, Pam and Franz! I took a semester of calligraphy in college and liked different pens since I was a kid, but my first real fountain pen was a 100 year Wahl Eversharp Skyline Deluxe purchased from Syd Saperstein at my first pen show, SF 2015. Holly!!!! Now that’s actually a very good first fountain pen. =) And that’s when I first met you as well. I must have had Sheaffer calligraphy pens before, but it was when I discovered Pilot Metropolitans on super clearance at a campus bookstore that I became hooked. I bought one, walked outside and sat at a picnic table, spent ages figuring out what the converter was and that it could be removed, and tried the pen. In two minutes, I was back inside the bookstore, buying their remaining stock ($11 each!) I still have three Metros from that first binge; the rest have been given away in the name of penvangelism. In school when we transitioned from pencil to fountain pen we were told to get Platignum. These were either cartridge, lever filler or what’s now called aromatic. Only Blue ink!we had to carry blotting paper and ink bottles. This was a gazillion years ago.. but fountain pens have always been part of my day never so much as now. I have yet to identify my first fountain pen, but will try again at the SF pen show. It’s a red metallic pen that I got in the mid-1980s from a small stationery store in SF. I didn’t buy another fountain pen until I discovered the pen accounts on Instagram a couple of years ago and bought a fistful of Pilot Varsitys. Great blog! Looking forward to more reviews. My first fountain pen was a Sheaffer School Pen. When they came on hang cards at the 5&10, not EBay! My gateway pen was a Metropolitan!